I received a Sleek Makeup palette in my Glossybox (get 50% off the April box with code GB50 here!) last month; it's been a while since I've tried anything new from Sleek, but the Eye & Cheek Palettes look perfect for travelling. 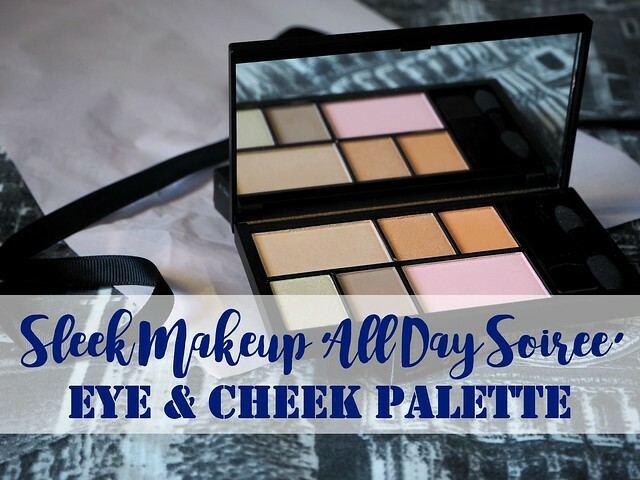 They each contain two cheek colours and four eyeshadows - I received the 'All Day Soireé' palette, which looks to contain some lovely daytime shades. On first impressions, this really reminded me of a NARS palette. The palette did come with a little brush, intended for the cheek shades, as well as a double-ended foam applicator for the eyeshadows, but I ended up chucking them as neither of them were much good. There's also a good-sized mirror in the lid of the palette which, again, really lends itself to a travel make-up bag! The two cheek products are both shimmery; I think they're both supposed to be blushers, but the left-hand one is definitely more of a highlight shade to my mind, being a pale champagne-type colour. 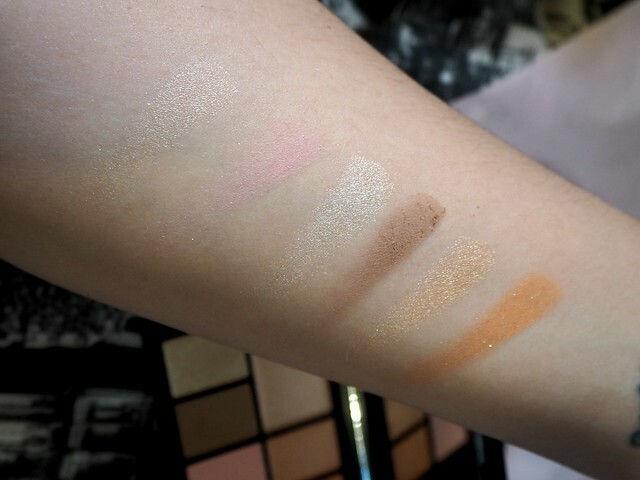 The right-hand one is a very pale pink which I didn't think would show up too well on the skin, and I was right - it's definitely more of a subtle shade, but perfect for giving just the barest hint of colour to the cheeks. Both transfer reasonably nicely to the skin, giving a touch of glow without any obvious chunks of glitter. 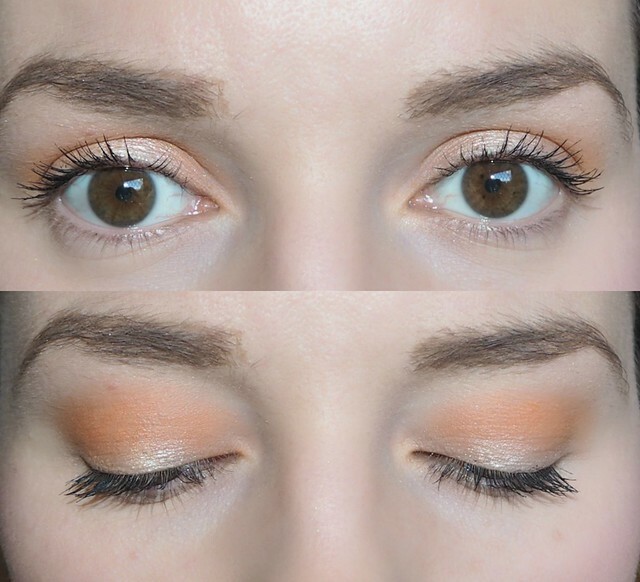 Meanwhile, the eye shades split quite nicely into two little duos - a matte mid-brown with a shimmery cream, and a matte peach/orange with a shimmery orange/gold. All four are well-pigmented, applying smoothly to the eyes - there's a bit of fallout from the matte brown shade, but the other three seem okay. I've found they wear well over a primer, and have easily lasted me 10 hours of wear even on my oily lids, without creasing or fading. As you can see below I've used the peach/orange shade all over my lid and up to the crease, paired with the shimmery gold/orange just on the lower part of my lid. I was unsure as to how wearable the orange shade would be for everyday wear, but I actually really like how they look on my eyes. They're super summery and look really striking, but I don't think they're too over the top? I think you'd struggle to get an evening look from this palette, but for daytime wear I really like the shades. 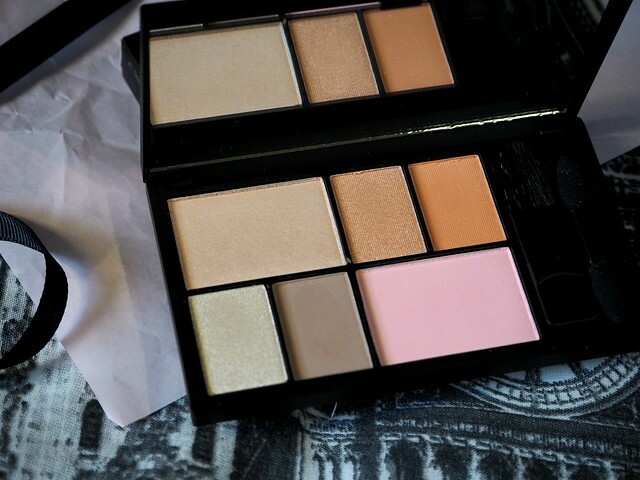 Overall, I've been pretty impressed with this palette; it'd be perfect for a weekend away to give yourself a blush, highlight and a couple of options for eye make-up, without taking up too much room in your make-up bag. I've found it super-handy for in my gym bag!! I'd like if the blusher was a little deeper in colour but all in all, I'm happy with the shades on offer. 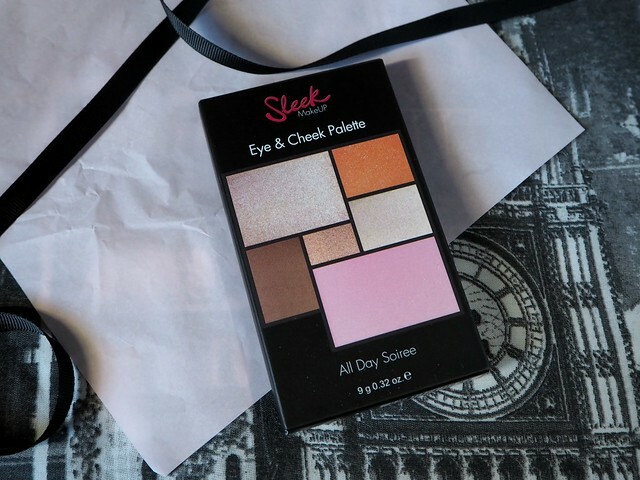 The Sleek Eye & Cheek Palette in 'All Day Soireé' is priced at £10 for 9g of product. Do you like the look of this palette? Would you wear these kinds of shades? My wife has been thinking about using a new type of colour, so I'll have to let her read this :) Thanks! What amazing value, I would definitely buy this for all those shades. What a lovely little palette! I love that you actually show how it looks on, so many times people don't bother & I don't feel like you get a proper feel for it! Great colours. Love the orange on you.